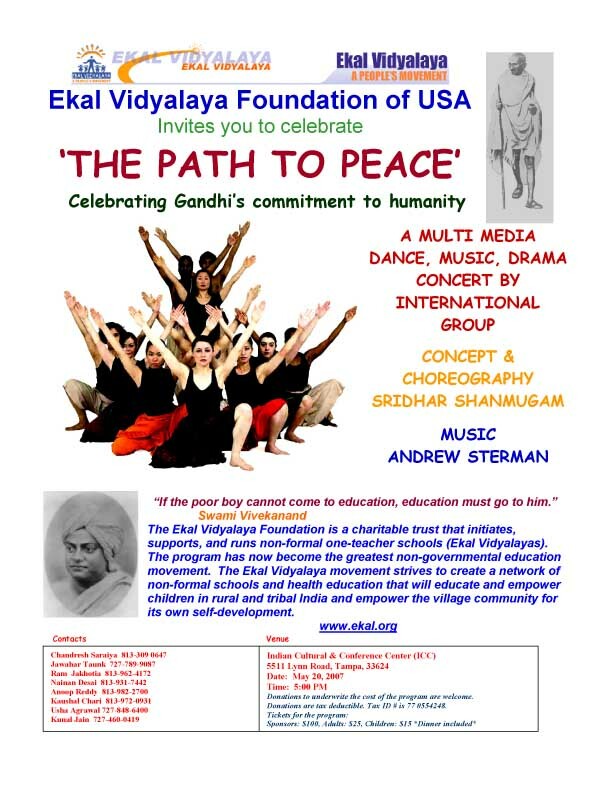 Ekal Movement received a donation of $100,000 (a hundred thousand dollars) from Shri Richard E Schaden through EVF USA. This is the biggest donation Ekal Movement has ever received from a person of non-Indian origin (Shri Schaden is American). Shri Schaden was introduced to the Ekal Movement by Dr. Surinder Garg (regional Vice President of EVF USA in Michigan). This signifies how truly global our movement and cause is and the deep chord it can strike with people across nationality and regions. 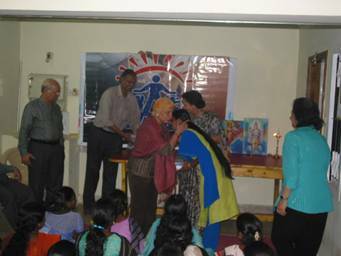 FTS Mumbai organized a Vanyaytra to Palghar Anchal. A group of 18 people undertook this one day trip visiting the villages of Tongerpada and Chamilpada. 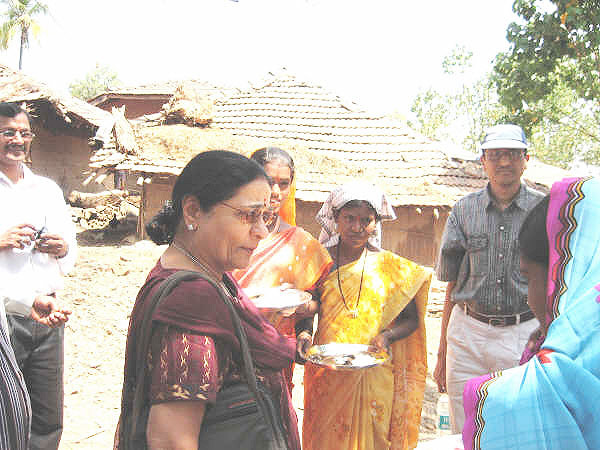 The warmth with which they were welcomed by their tribal brethren touched the visitors deeply. They immediately felt they were part of their extended family, sharing their meal, sharing thoughts and viewpoints. 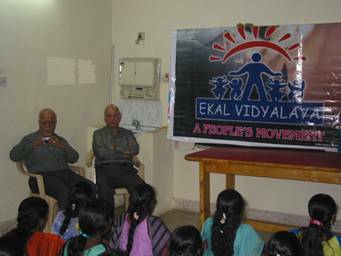 During their interaction with the Ekal students (numbering around 35), the visitors were impressed by their confidence, motivation and articulation. In general, the visitors experienced first-hand the excellent work done by the Gram Vikas Samiti, the synergy between the samiti members and Ekal acharyas and high motivation of the tribal brethren. The visitors returned with beautiful memories of a lovely day. Smt. 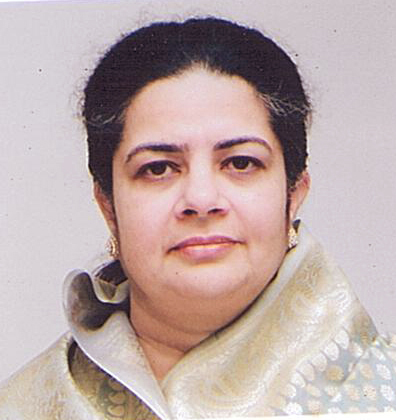 Rajashree Birla is a Director on the Board of all the major Aditya Birla Group of Companies; viz., Grasim, Hindalco, Aditya Birla Nuvo and UltraTech Cement Ltd. Additionally, Mrs. Birla serves as a Director on the Board of the Aditya Birla Group's International Companies spanning Thailand, Indonesia, Philippines and Egypt. As Chairperson of the Aditya Birla Centre for Community Initiatives and Rural Development, the apex body responsible for development projects, Mrs. Birla spearheads the Group's social and welfare driven work across 30 companies. These encompass innovative projects such as providing the rural youth with a chance to shape their future through sustainable employment schemes, education and training, making safe drinking water easily accessible and women empowerment programmes. Other equally significant areas of the community work done under her stewardship includes reaching out to physically impaired people, espousing social causes like widow remarriages and dowry-less marriages. In recognition of the exemplary work done by her and for making a qualitative difference to the lives of the less privileged, Mrs. Birla received "The Economic Times' Corporate Citizen 2001-2002 Award" on behalf of the Group. 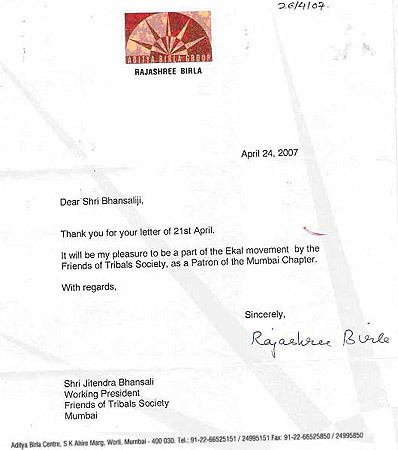 The Rotary Club of Bombay conferred "The Citizen of Bombay Award 2003", while the Rotarians in Action named her for "The Seva Shiromani Award". FTS Mumbai is truly honored by her patronage! The first ”Vishwa Go Sammelan” (world summit on Cow) took place in Shimoga district of Karnataka, between the 21st and 29th of April. The summit was held at the Mutt of Srimad Jagadguru Shankaracharya Shri Shri Raghaveshwara Bharathi Mahaswamiji. The Mutt has thirty-three breeds of cow and a dedicated team of scientists involved in advanced research on the cow. Shri H D Kumaraswamy, Chief Minister of Karnataka was himself part of the welcome committee for this great event. Around 20 Lakh people including scientists, cow specialists, economists, sociologists, religious leaders from all over the world participated in this summit. Many important papers were presented during the knowledge workshop, especially by participants from European Union, Russia, Germany and Kenya to mention a few. The presentation given by Sri K. E. N. Raghavan - the central chief of Ekal’s Gram Vikas Scheme was awarded the “Gopal Gaurav Tamra Patra” at this summit. It was highly appreciated by Swamiji himself for re-establishing the importance of cow and the tremendous progress made by using the cow as the basis of the rural economy. Taking time off his busy schedule, Shri Jagmohan Maheswaryji (Vice-President of Bangalore Chapter, FTS) visited the Anchal Prathmik Varg in the Ooty NATC. He was accompanied by Smt Chellaramji and Shri Chellaramji. 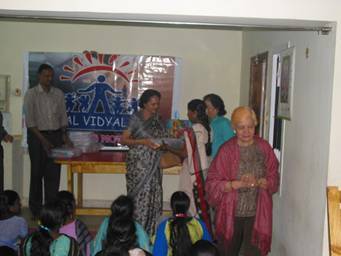 They interacted with the Arogya Sevikas and presented them with first-aid boxes. Smt Chellaramji warmly appreciated the efforts of the Arogya Sevikas. Shri Maheswaryji, in his inspiring speech pointed out the profound impact the “Seva” offered by the Arogya Sevikas is having on the community and praised them for their selfless actions. The pictures below capture a few moments from this trip.